« Put an owl on it! Indoor mushrooms: the gateway drug. We’re growing mushrooms! Shiitakes. Indoors. 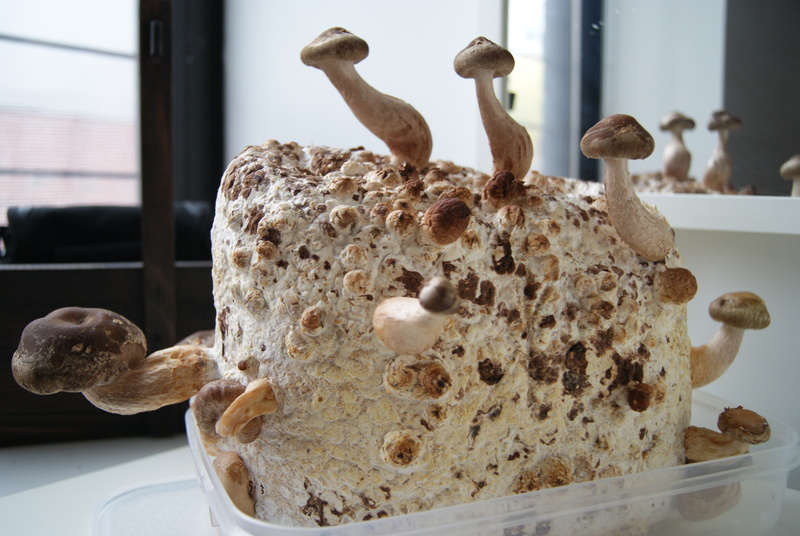 When all of the uproar about the term “Urban Homesteading” began last week, I was dutifully spraying an odd-looking block of sawdust twice a day that had been inoculated with shiitake spores. Inspired by this Huffington Post article, I ordered it through Amazon as a project to do with my kids – something more akin to a Butterfly Garden (a family favorite) than actual indoor agriculture. As promised, within two weeks our sawdust block went gangbusters with mushrooms – enough for one main course for two adults (which is fine because, as it turns out, my children love to grow mushrooms, but not eat them). In the meantime, the “Take Back Urban Homesteading(s)” page on Facebook had grown to over 5,000 followers, and I spent some time acquainting myself with the dozens (no, hundreds!) of blogs and websites published by people living in various degrees of the urban who are experimenting with sustainable living, growing their own food and reviving lost domestic arts. Regardless of how the trademark issue ends up, the galvanization of this community has been exciting for this armchair urban farmer. I discovered Grown in the City and FarmCurious, sites devoted to practical resources for urban gardening and composting, as well as a number of other interesting folks doing really creative things in small spaces that I will soon be adding to my blogroll. So, are we urban homesteaders too? We have the urban pretty well covered. You can’t get more city than a 9th floor apartment in a midtown Manhattan high-rise – a place I never thought I would find myself, but strangely can’t imagine leaving. As far as sustainability goes, we’ve got it going on: no car, small footprint, features common to living in Gotham. According to David Owen, New York is the greenest city in America. While I have dreams of keeping bees and chickens on our rooftop, I must content myself with our shared garden that is lovely for playing in a sandbox or having coffee, but doesn’t get enough light to grow food. So it’s all indoor gardening for us. Except for one thing: we don’t actually have any plants. Mostly because our cat eats them, but also because I recently found out I don’t actually have much of a green thumb. Last year, we started 5 large window boxes in our sunny stairwell windows, planting everything from strawberries to tomatoes to quinoa. And it was a dismal failure. The strawberries developed bugs, the tomato plants produced one puny tomato and the quinoa only grew 4 inches (although it was fun to grow something straight from the kitchen). So you can imagine my delight when after two weeks of spraying my indoor mushroom farm, I actually got a whole bunch of mushrooms! Enough to sauté over rice or add to miso soup. I’m hooked and I’ve already ordered another mushroom kit – an actual log this time. But this project hardly qualifies as urban homesteading – or even urban gardening. However, it has encouraged me to build a window farm, which you are sure to be hearing more about. Are you gardening indoors? I would love to hear what you are growing! This entry was posted on March 1, 2011, 11:30 pm and is filed under garden, Urban Homestead. You can follow any responses to this entry through RSS 2.0. You can leave a response, or trackback from your own site. 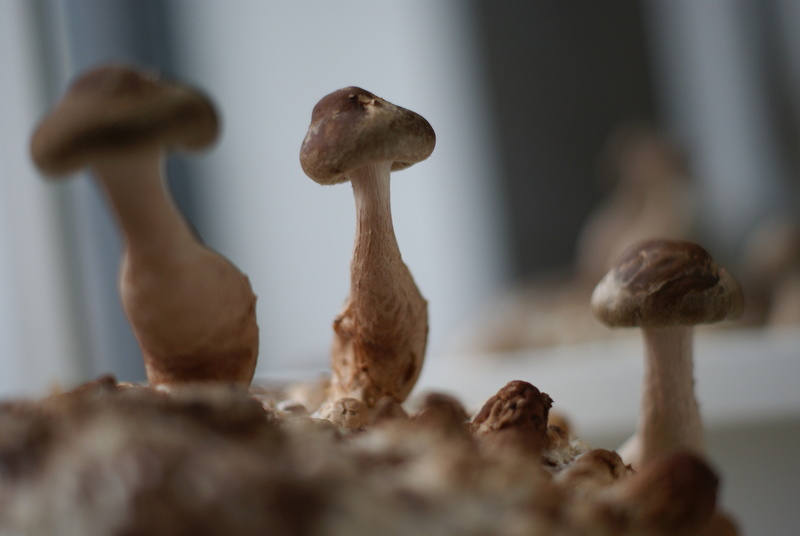 great post… i’ve never really thought of growing mushrooms … but you could be changing my mind…. Believe me, if I can do it you can do it. I just ordered an actual log this time. It’s nicer looking and apparently can produce mushrooms for up to 2 years. I haven’t started it yet, but so far I would recommend it based on aesthetics alone.